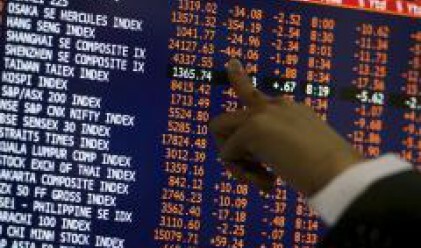 The indexes of the Bulgarian Stock Exchange (BSE) ended the first week of June in negative territory, just as they started it. Unlike the previous three weeks, when the indexes posted weekly gains, they ended today sessin below their April 30 levels. The SOFIX blue-chip index lost 2.75% on a weekly basis closing at 1,225.34 points today. The broader BG40 index ended at 338.39 points with a weekly loss of 3.33%. The BGREIT index shed 0.89% to 95.28 points this week, while the BG TR30 index slipped by 2.43% to 822.64 points. BSE's trading turnover amounted to 6.68 mln leva today with a total of 132 issues traded. The number of advancing issues stood at 42. The value of the block and other registered deals totaled nearly 3 mln leva. The declining issues within the BG40 exceeded the advancers at a ratio of 32/8 in the period May 30 to June 6. Lomsko Pivo was BG40's biggest advancer this week. The stock appreciated by 3.88% to an average of 3.75 leva per share. The company auctioned successfully a total of 250,000 shares at an average price of 5.2 leva per share this week. TK Hold's stock price went up by 2.58% to an average of 5.96 leva per share over the past five trading sessions. The company booked 395,000 leva consolidated profit for the first quarter of the year, up 65% year on year. Devin advanced by 2.24% to an average of 5.01 leva per share. The stock ended last Friday's session at an average price of 4.9 leva per share. Synergon Holding was among BSE's losers this week. The stock shed 7.47% of its value to an average of 8.8 leva per share. Aroma skidded 7.08% lower to 3.41 leva per share. Odessos Ship Repair Yard lost 6.3% on a weekly basis closing at an average of 260 leva per share today.